An increasing bounce rate is one of the many signs of an eminent failure in search engine optimization. A bounce rate that is close to 100% percent indicates that there is growing disinterest in the content available in your website. There are numerous factors that can be attributed to raising bounce rate and understanding them helps you curb the rise and stay ahead of your competition. We are going to focus on understanding bounce rate, and learn how we can reduce it in WordPress. Bounce rate means the percentage of people who visit your website and leave (‘bounce’) without taking more time to check other pages on your website. Tracking bounce rate is very important for your website since you will be able to gauge whether the visitors on your website are interested in your content or not. Bounce rate is the best measure of effectiveness of your content and can be a good place to begin improving your user's experience. The image below shows the bounce rate of 86.96% in one of my blogs, you too can add Google Analytics on your website and monitor your bounce rate. 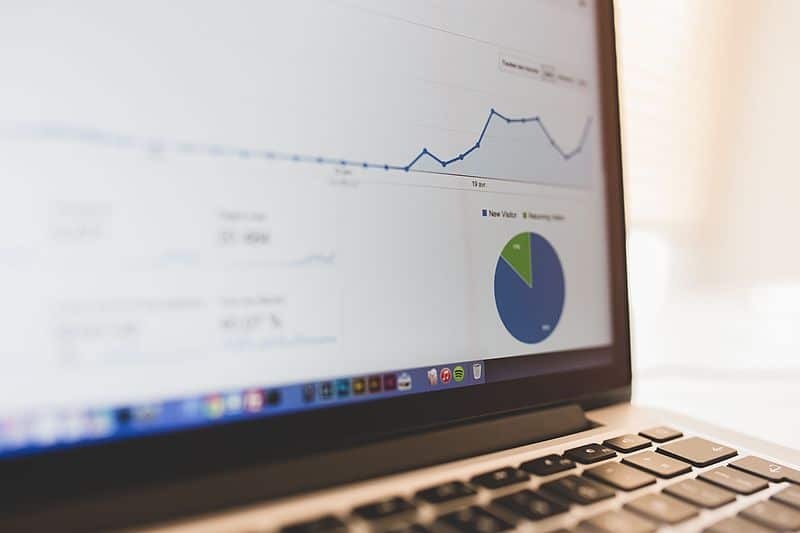 Google Analytics helps you monitor a number of metrics that determine the health of your website. As you can see from the image above the pages and sessions are closely related to the bounce rate. There are a number of factors that drive the bounce rate to increase, like the design of the site and user experience. In the contrary some visitors leave the site after viewing a single page if they have found the information the visitor was looking for. Websites with only a single page may experience a higher bounce rate than other websites. How is Bounce Rate Measured? Now that you know about bounce rate, you may wonder exactly how the percentage if calculated and how to analyze it for your SEO purposes. This percentage is calculated as the ratio between bounced visitors and total visitors on your website. You will not be calculating bounce rate but will be viewing it on the Google Analytics account. If you have installed Google Analytics on your blog, you should be able to track the bounce rate of each of the pages on your website. When you look at the bounce rate you should know, the closer the percentage is to 100% the poor the content on your website. Ideally, you should get worried if your bounce rate exceeds 60%. If your bounce rate is below 50% this indicates that your site is good. High bounce rate is also a bad SEO sign for you since search engines will tend to penalize such websites. Websites with high bounce rate seems not to offer any value to visitors. You should therefore look for ways to reduce your bounce rate and improve your website ranking. We are now going to focus on the different ways that can be employed to keep visitors more engaged with your website content. If you are experiencing high bounce rate above 90%, you need to employ these tips to bring it down and improve user experience and consequently website ranking. The first step towards reducing bounce rate on your website is to do away with all the popups. Popups are often used for a number of reasons in WordPress that include; email signups, social media promotion and advertisements. Nothing sends visitors away from your website than popups, especially in new websites. You should therefore avoid using popups or if you must use them, it should be sparingly. You should also ensure your popups have a clear way to close them since persistent popups drives visitors away from your website. You can also incorporate the side popups or bottom popups instead of using those that block the entire site. Recently I wrote a tutorial on how to build a responsive WordPress navigation. A menu in a website is equivalent to a map and it should help your visitors get across your website with ease. Your menus should be easy to use and they should all be clickable. Make use of WordPress categories, custom menus and pages to organize your website navigation properly. You should also ensure your menu is responsive and easily accessible in mobile gadgets and tablets. There are more and more people accessing the web via smartphones and tablets. These statistics show a growing trend that you need to consider when building a WordPress blog. When you are building your WordPress site you should ensure you use or build a responsive theme. This will help reduce bounce rate from mobile users. There are tons of free WordPress themes that are responsive and ready for use. A well coded responsive WordPress theme also helps solve the problem I mentioned earlier regarding navigation. The amount of time a site takes to load has a serious role to play in SEO. Once you achieve a good load speed on your website, you will see bounce rate reduce drastically. There are a number of ways to improve website load speed that include; caching, slicing images, using content delivery network, among others. There are also several WordPress plugins that can help you improve the site load speed. If your website takes more than 10 seconds to load you should work on improving the speed. Internal website links are the best way to quickly reduce your bounce rate as well as improve your search engine ranking. Since I started implementing internal links as a strategy of reducing bounce rate, I noted significant improvement on website ranking. 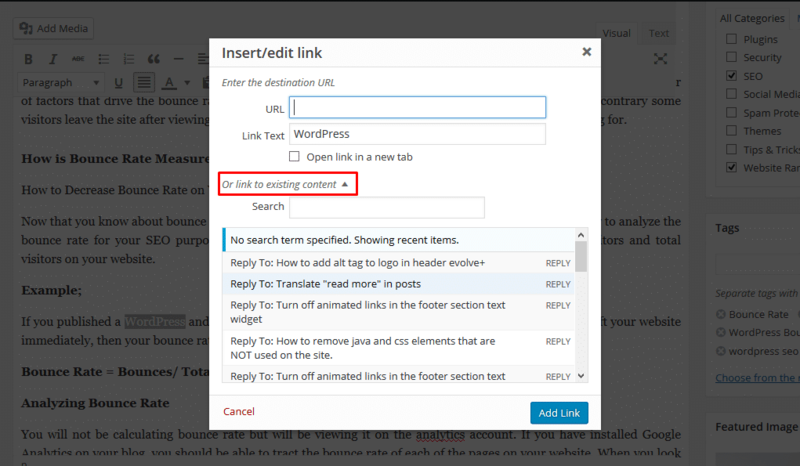 WordPress link feature allows you to link to existing content in your website. The more internal links you create in your WordPress posts the lower will be your bounce rate. You should create the internal links based on relevance in order to promote related content. WordPress tags area great way to improve your internal linking. You should add related posts at the bottom of the posts using a plugin or as a feature in your theme as anther ingenue way of linking your posts. For you to leverage on 'related posts feature' posts should have well written titles that helps improve the click through rate. You should closely monitor links in your website using Google Webmaster Console to see which links are broken. Broken links can cause an increase the rate in which visitors leave your website and should be fixed as soon as they are found. There are also several other free tools you can use to analyze your website links and identify broken links. Google Webmaster Tools is good since you get a prompt report about broken links on your website. High number of 404 pages can increase your bounce rate especially when they are not helpful. You should make your 404 pages helpful by creating alternatives for visitors to return to the home or view alternative pages. Just as I wrote in the tutorial – Building WordPress Custom 404 Page, you should consider making a custom 404 page. You should ensure you use 301 redirect for old permalinks on your WordPress blog since they are likely to be 404 pages. When you are linking to external websites you should be careful not to lose your website visitor by opening the link on the same tab or window. You should instead target to open all external links in new tabs or windows. You can achieve this by adding; target=”_blank” to your URLs. By creating these kind of links, you ensure that you do not lose website visitors when they click on external links. Ads can be a nice complement to good website design but if they are obstructive and distractive they lead to a high bounce rate. You should limit the location of ads to sidebars, below posts and when you use them inside content you should clearly separate them from content. You should avoid using popup ads on your site unless they are used for a short period of time. They can be used for special promotions or discounts that run only for a few days. There is no doubt about the value that good content contributes towards increasing your website audience and readership. If you produce useful content for your audience you will obviously make visitors stay longer in your website. Improving content should be the first and long term strategy you take towards reducing bounce rate. The content should not only be free of grammar mistakes but should also be useful to readers. Your content should be well organized to make it easier to read. Use bullets points to list items and H1- H6 headings to clearly show the content titles. You should also use both video and image content to spruce up your website content. Now that we have looked at the different ways of reducing bounce rate on your WordPress site. You should implement these measures on your blog to improve traffic and search engine ranking. The overall goal of your effort to reduce bounce rate should be to improve user experience and build a loyal audience. This can only be achieved if you create high quality content, link appropriately, build a responsive website and augment it with good design. There’s a lot more you can offer than just building a site. Excellent work. You have shared a very useful content. Indeed, you pointed out the most powerful solution of reducing website bounce rate. Also, explained the definition and how to calculate bounce rate. I like you have pointed out the pop up the very first point of your post. This is the one thing i dislike mostly and nearly many people leave the site after visiting. Others things as well load time, clear relevant content, page navigation etc. are also useful elements for measuring bounce rate. Thanks a lot for sharing a very useful post.